After years and years of high school computer classes and hours upon hours of practicing on Messenger and Facebook Chat, I am happy to announce that I am accomplished in touch typing. Well I was, before I moved to Japan and someone moved the ‘@’ key. Its place of residence is now to the right of the ‘p’ button, and does not require the simultaneous pressing of shift. Not that big of a deal, right? Wrong! Typing an email becomes quite stressful if you need to look at the keyboard for a solid minute to find the @ button every time. And blogging about said @ key is just as annoying. But wait, there’s more. More keys that is. More keys that have moved that is. Actually there are quite a few differences on a Japanese keyboard as you may notice from this picture. Another one that frequently trips me up is the apostrophe. Now, just between us, I never really found the apostrophe key all that useful in the first place. I mean don’t versus dont, who cares right? Spell check will add it in for you if it’s really important. However, now that I am an English teacher, and must set a good example, I find myself using it a lot more frequently, when I can find it that is. It hides as a shift function of the ‘7’ key. One upside to all of this confusion is my favorite button, to the left of the ‘1’ key. It may look daunting with all of the Japanese on it, but damn is it handy. 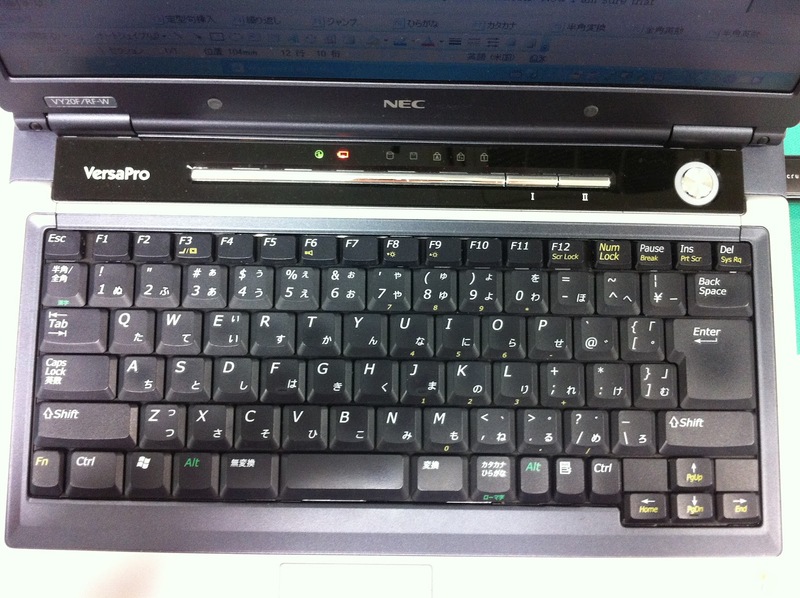 With on touch of this button you can change from typing in Japanese to typing in English. This is unbelievably helpful when you are making bilingual worksheets. Now I am sure that there is some kind of control shift whatever function that will allow me to do this on my own computer, but I definitely prefer the convenience of the one touch button. After reading this, I suspect you will have one or both of these thoughts. The first is that I have way too much free time on my hands, since I am writing about a keyboard. This is mostly true. The second is why. Why am I talking about keyboards? Surely there is some more significant difference that I could be mentioning, chopsticks, or raw food, or bowing. The truth is that there are a lot of differences between Australian and Japanese cultures. But it tends to be the little things that catch you off guard the most, as these are the things that you take for granted in your own country. So, next time you are typing, or visiting a foreign country, spare a thought for the little things.